In meeting with PM, Father Gabriel Nadaf reaffirms his commitment to Christian Arab integration into Israeli society. In the face of severe opposition – some would say persecution – by the leaders of his church, Father Gabriel Nadaf, a Greek Orthodox priest from Nazareth and spiritual leader of a forum for the enlistment of Christian youth in the IDF, continues to advocate for a strong connection among Arab Christians with the State of Israel. On Monday, Nadaf met with Prime Minister Binyamin Netanyahu to discuss issues affecting his community, and ways the state could help him encourage greater participation of Christian Arab youth in Israeli society. Netanyahu instructed that a joint government-community forum be established to promote the enlistment of Christian community youth into the IDF and national service, and to encourage their integration into the life of the state. The forum will work to include members of the Christian community in dealing with the administrative and legal aspects of enlistment to the IDF, to protect those who support enlistment - as well as enlistees themselves - from violence and threats, and to step up law enforcement efforts against those who disturb the peace and incite to violence. 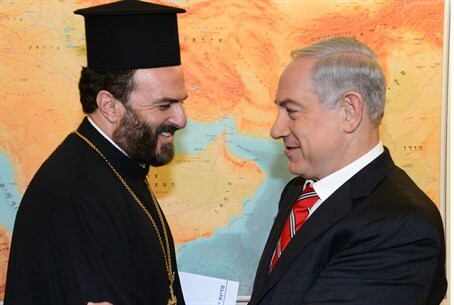 Nadaf is unique among Orthodox Christian leaders in that he advocates a strong connection between his community and the state – and for that he has been sanctioned by the official Greek Orthodox church, which has sought to have him defrocked. Arab MKs have also condemned him, calling him “an agent of Zionism who seeks to divide Arabs.” Nadaf has also been threatened with violence, and even death, he told Israeli reporters. But he insists that he represents a sizable portion of the Christian Israeli community. There has been a significant increase in the number of Christian enlistees in the IDF recently – much of it due to Nadaf's advocacy – with recruitment jumping from just 35 a year ago to approximately 100 this year. An additional 500 young people from the community are doing national service. Israel is the only country in the Middle East where the Christian population is actually growing, as incitement, terrorism and mass-killings by Islamists is driving out Christians from countries such as Egypt, Syria, Iraq and Iran. Some analysts see the growth in Israeli Christian enlistment as an acknowledgement of the fact that - with radical Islam on the rise - the State of Israel may be the last safe-haven they have.